Aries (21 March – 20 April) is a Cardinal zodiac sign. Cancer (22 June – 22 July) is a Cardinal zodiac sign. Libra ( 24 September – 23 October) is a Cardinal zodiac sign. Capricorn (22 December-20 January) is a Cardinal zodiac sign. 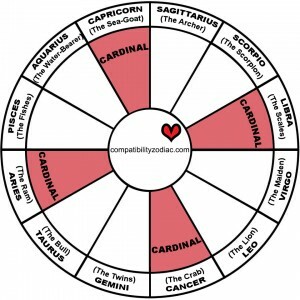 What is a Cardinal zodiac sign? Each Cardinal zodiac sign starts a new season: Aries starts spring, Cancer starts summer, Libra starts autumn and Capricorn starts winter. The Cardinal zodiac signs indicate that the time has come for a new beginning. Cardinal zodiac sign natives are self-motivated and often self-taught people. They enjoy learning new things. Avid researchers, Cardinal zodiac sign natives will use part of their free time to learn about new trends in their area of interest. Active and ambitious, they work hard towards their career goals. Their creativity is very appreciated. They come up with interesting insights and original solutions. A conversation with a Cardinal zodiac sign native is always fascinating. Cardinal zodiac sign natives are at ease in social gatherings and feel comfortable talking with people. They tend to initiate the conversation and to direct it’s course. There are two ways in which a Cardinal zodiac sign native might behave at a party: either is the heart and soul of it, either stays in a quiet corner enjoying the privacy. Be it the star of the party or the mysterious loner, a Cardinal zodiac sign native will be equally fascinating and seductive. Cardinal zodiac sign natives are the “all-or-nothing” type of people. They don’t have time nor energy for non-sense. They search for a matching partner and a long term commitment. More often than not they like to be in control in the game of seduction. In a relationship, they seek respect and passion. You are a Cardinal zodiac sign and your partner is: Aries, Taurus, Gemini, Cancer, Leo, Virgo, Libra, Scorpio, Sagittarius, Capricorn, Aquarius, Pisces.